When the patriarch of a New Orleans crime family dies in a fight-to-the-death with a Chanas Indian chief on the banks of the Mississippi River, little does he know his direct descendant, William Laveaux, will seek revenge 75 years later. In 1923, William (aka the Prince) leads his gang to Gary, Texas—a sleepy hill country town on the banks of the Guadalupe River—to exact a brutal revenge on Chief Running Wolf and his grandson Billy Cross. Wise-cracking Sheriff Bud Thomas (a former Rough Rider and Texas Ranger) overhears the son of the town doctor telling of his chance encounter with the crime lord on the morning of his arrival at the town’s train station. Following his gut instincts, the sheriff leads his deputies on a frantic manhunt for the Prince and his gang as they weave a trail of murder and arson throughout the farming community. On its surface, this novel pits the working class folk of a small Texas town against a ruthless crime lord intent on avenging the death of his grandfather. At its core, it’s a novel about the spirituality of the people and of the native American culture that pre-dated their time in the land of the Sacred River. Mark Guillerman has always had an interest in the Texas hill country and Texas history. 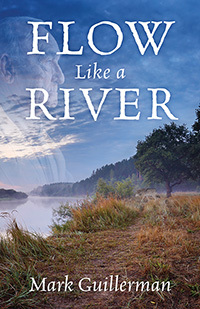 He’s stayed true to both the spirit of the people and of the land itself in the 1920s in his debut novel, Flow Like A River.